Maine Pyar Kiya: She played Salman Khan’s traditional, understanding mom. Despite pressure from her husband to break them apart, she supported her son’s lady love. Hum Aapke Hain Kaun: Here, she played mom to Madhuri Dixit and Renuka Shahane. She raises them as sweet, charismatic women who keep the family together. She was also popular as beautiful ‘mother of the bride’. Hum Sath Sath Hain: She played mom to Mohnish Bahl, Salman Khan, Saif Ali Khan and Neelam. Because of her character, she was better known as the new-age Kalki. Kuch Kuch Hota Hai: In Kuch Kuch Hota Hai, she played a loving mother to Kajol. While she desires Kajol to marry Salman Khan’s character but in her heart, she knew Kajol was unhappy with her choice. Jis Desh Main Gangaa Rehta Hai: A rich family from a big city put their little son Govinda as a grown up under the care of Reema Lagoo and Shivaji Satam, two sheep-herders. But when it is time for him to leave as a grown-up, it tears her heart to watch him go. Her love for him, the bond Govinda shares with his fellow villagers brings him back. Vaastv: This role led her to win her fourth Film fare Award for the best supporting actress. She played mother to gangster Sanjay Dutt. Defeated by the life her son has chosen to lead, she makes the tragic decision to take his life. Kal Ho Naa Ho: She played the mom to Shah Rukh Khan. The hardest thing a mom could go through is watching her child die. As Shah Rukh Khan did his best to bring joy to other’s lives, she, on the other hand, put a brave face every time to hide her pain. Shriman Shrimati: Shrimaan Shrimati was a popular sitcom that first aired on Doordarshan in 1994 starring Jatin Kanakia, Rakesh Bedi, Reema Lagoo and Archana Puran Singh. She played the character of Kokila Kulkarni a.k.a. Koki, Keshav’s wife, and a smart homemaker. Tu Tu Main Main: Tu Tu Main Main is another Indian sitcom television series which first aired on DD Metro then Star Plus was directed by Sachin Pilgaonkar. In this, Reema Lagoo as Devaki Verma played the character of notorious mother-in-law to Supriya Pilgaonkar. Naamkarann: It is an Indian Hindi romantic drama television series, which is broadcasted on Star Plus. It’s inspired by the 1998 movie Zakhm based on Mahesh Bhatt’s life. Reema Lagoo as Dayavanti Mehta was playing the character of the main antagonist. 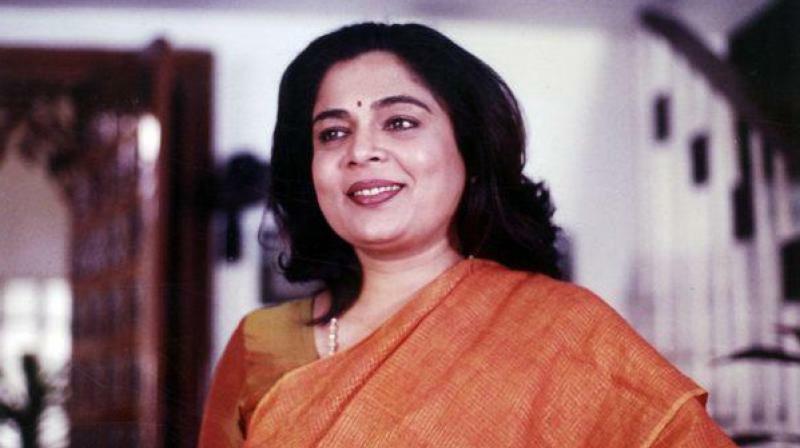 Surely, the cast of Naamkarann will be in shock because of Reema Lagoo’s sudden death. This article is a tribute to her. May her soul rest in peace. You will be missed.